An opportunity to view Pottinger’s full line-up of grass, forage, tillage and drilling products at its Corby, Northants base attracted customers and dealers from throughout the UK. David Williams reports. New grass and forage products displayed included the Impress 125FC Pro fixed chamber baler-wrapper combination. The baler shares all the main features of Impress solo round balers but incorporates a wrapper; allowing bales to be made and wrapped in a single pass, improving stored bale quality and reducing time and labour requirements. Operation is automatic and only very brief stopping times are needed. There are two models currently including the 125FC Pro, which produces bales of 125cm diameter and a variable chamber version; the Impress 155VC Pro which produces bales from 1.1–1.5m diameter. Operation is from the Pottinger Power Control terminal or by the tractor display using an Isobus link. Operators can select between manual or automatic operation. The double wrapping arms are supported from below with no overhead support, and an advantage of the design is low height, increasing stability. The wrapper runs at 36rpm and film stretching to 50 or 70 per cent is selected by switching the drive chain. Convenient film replacement is achieved through a hydraulic folding film magazine which accommodates up to six pairs of two rolls of film per side. Baler wrapper combinations are built around top Pro-specification balers with Flexcut 32 chopping units, borrowed from the company’s loader wagons, fitted as standard. Selecting the maximum 32 knives achieves 36mm chop length – claimed to be the shortest on the market. The blades are reversible for reduced downtime and have individual knife protection. Advantages of the short chop include up to 20 per cent higher bale density; reducing plastic, transport and storage costs, and for silage homogenous composition – ensuring stable fermentation. Like Pottinger’s standard balers; material enters the chamber over the top of the rotor rather than underneath, and a spiral blade layout provides an even feed. The new baler/wrappers are available for this grass harvesting season and many dealers will operate demonstration machines as demand is expected to be high, stressed Shaun. Using an auger to transfer tall crops such as forage rye and wholecrop is claimed to be more efficient than conveyor-type mergers, with positive crop engagement providing faster operation and using up to 20 per cent less power. When it isn’t needed the Crossflow auger’s rear hood is opened allowing forage to be distributed evenly across the width. The new A10 Crossflow incorporates left and right rear units, and operates with a front-mounted centre mower, giving 8.86–10.00m working width. The effective width can be adjusted in work to suit the crop volume and to compensate during turns for complete ground coverage. “Operating without a conditioner means it costs less and is lighter,” pointed out Shaun. “The A10 Crossflow weighs only 3t whereas an equivalent mower conditioner and belt merger weighs approximately 1t more. Terradisc compact disc harrows have been available in 3.0, 3.5 and 4.0m mounted versions for several years but new, wider trailed models are available for the first time this year in 8.0 and 10.0m working widths. The versatile Terradisc has proved popular with users for its ability to perform both shallow and deeper cultivations making it ideal for early and late autumn, and spring soil management. Recent years have seen demand for high-speed shallow stubble cultivators increase considerably as more growers adopt stale seedbed techniques to help tackle persistent grass weed populations. The Terradisc is ideal, but equally effective to create seedbeds after ploughing or other primary cultivations, or even direct into stubbles where conditions allow. The new Terradisc 8001 T and 10001 T share the same layout as the smaller units and can handle large amounts of straw and mulch without blocking. Working speeds up to 18kph are typical providing high work rates. The discs are mounted at an aggressive working angle for effective penetration in dry conditions and mounted in pairs for accurate ground contour following. Working depth is hydraulically adjusted between 5–15cm and the standard version operates from spool valves whereas an upgrade option provides full Isobus control, making it easier to integrate the implement with GPS-guided variable tillage. Horizontal folding allows the wide discs to remain at under 4m height. The new distributor heads also allow full section control by 1m increments, replacing full width shut-off available previously. For the start of the season only full-width will be available, but a software update due later will provide owners with the extra precision. The new Impress baler-wrappers were designed by Pottinger’s team to perform well on the steep slopes of Austrian farms, and bale transfer to the wrapping table on slopes up to 40 degrees is standard. The new Novocat A10 Cross Flow swath merger was displayed for the first time. Working width is adjustable between 8.86–10.00m and automatic compensation for turns is available, ensuring areas aren’t missed. Auger swath merging is said to be more efficient than a conveyor belt and requires 20 per cent less fuel than models equipped with conditioners. “The Terradisc disc cultivators are excellent,” added Adrian. 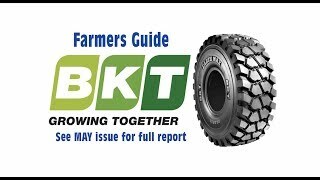 “The disc spacing and diameter is perfect for most situations and the weight of the machine and disc angle ensures it penetrates well, even at high speeds in the dry when farmers are creating stale seedbeds. It bites in and pulls the soil up to stimulate weed growth and it’s easy to pull too so doesn’t need a big tractor. “We run a demonstration forage wagon and believe there is huge potential for these in our area. We also run front and rear mowers, and for the coming season have added a Hit 881 tedder and are keeping Top 842 and 762 rakes in stock,” he added. The first wide trailed Terradisc disc cultivator sold in the UK was at the event. It has been purchased with the 9m Terrasem also featured, by Norfolk-based Waldersey Farms and farm manager Adrian Kew explained that the farmed area includes approximately 2,600ha of winter and 400ha of spring cropping, plus peas and cover crops all established by the farm’s previous Terrasem drill. Adrian said soils on the farm range from black fen to heavy skirt and silt and as well as combinable crops the farm produces potatoes, onions, sugar beet and vegetables. “Back-up has been very good from our dealer Harrison Tractors, and from Pottinger,” he explained. “We wouldn’t be buying another Pottinger Terrasem if it wasn’t. It’s used behind a John Deere 8340RT rubber tracked crawler which is a good match for it. James Green Farm Machinery operates from Studley, Warks, looking after the Warwickshire and north Cotswold areas. Sales representative Tom Laight is pictured at the Pottinger event and said that when he joined four years ago the Pottinger brand was already well established with the dealer. “We like Pottinger and it fits well with our Case IH franchise, both being from Austria,” he said. “I love selling it. Once it is sold and installed then we don’t hear anything from users until replacement wearing parts are needed; it’s so well built. “Since taking on Pottinger in 2015, we have supplied mainly tillage products, but also more grassland machinery than we had expected considering our predominantly arable trading area,” explained James. 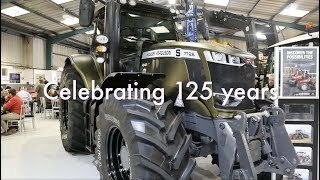 “We were Tillage dealer of the year in 2017 and I think the secret to Pottinger’s popularity and our success with the brand is the excellent build quality, the team which is great to work with, very good after-sales support and a positive response to assisting with demonstrations. A Terrasem T9, 9m drill was displayed, with larger distributor heads incorporating individual row shut-off selectable manually or automatically from the cab. The large distributor heads retract automatically when the drill is folded by hydraulic rams.